This experience has been carefully designed to offer an excellent sightseeing adventure for the whole family, see all the famous sights and landmarks of London as you whizz along the Thames in our speedy speed boat. 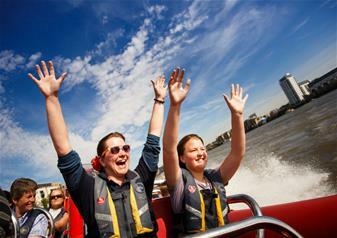 Kids are not usually keen on sightseeing but they’ll love this fun-filled speedboat ride along the historic River Thames taking in all the sites from Houses of Parliament down past St Paul's and through Tower Bridge. No other boat experience allows you to cover so much of the Thames in such a short period of time. Absorb the history of years gone by as the water laps at your sides and enjoy the spontaneous narration from your award-winning stand-up comedian guide before holding on tight for an exhilarating trip to Canary Wharf and back. This is family sightseeing adventure at its best! Your confirmation voucher provides you with full information about the Local Operator (including contact details). You can rest assured that we select only the most reliable and experienced operators in each destination.